Boy, do I hope this is true. But it strikes me as woefully wishful thinking. One of the reasons I opposed reappointing Bernanke is that I’d like to have someone running the Fed who’s serious about reregulating the financial industry, both at a macro and a consumer level. With Bernanke, though, we’re taking a flyer. We’re hoping that the crisis of the last two years has fundamentally changed his view of market self-regulation, and that he’ll apply the same suppleness and creativity he showed dealing with the meltdown to dealing with post-crisis regulatory issues. And maybe he will. But people rarely change lifelong worldviews even after they’ve lived through a catastrophe, and Bernanke has done nothing to make us think he’s an exception. Contra Mark, my guess is that when it comes to actual, concrete legislation and rulemaking, he’ll revert to the same Ben Bernanke he’s always been. When that happens, we’ll have missed our only chance for years to really reform our financial system. The White House will likely learn that a Fed chaired by Ben Bernanke will follow a policy uncomfortably tight as the 2012 election looms into sight. [Italics mine.] 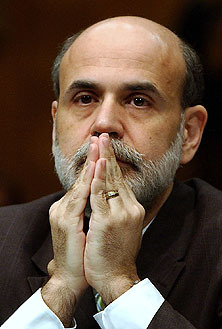 Bernanke has espoused a commitment to low inflation over his entire career. He also is a democratic and consultative chairman, so the voices of monetary conservatives among Fed officials will be heard loudly and frequently. Now this one I believe. That’s what Fed chairmen usually do to Democratic presidents, after all.